This new shared path running through the park that separates Glebe Road from Railway Street at The Junction is certainly in a prime location for visibility and pleasant recreational cycling. It meanders through the tree lined parkland, conveniently close to pubs, a strip of shops, schools and many other inner city conveniences. It is right beside the busy Glebe Road, yet well and truly safe and separate from it, making cyclists visible to passing motorists yet not a part of the traffic. A truly perfect scenario for creating a liveable city! The path is only about 100 metres long, and ends at the busy Union Street intersection, with seemingly nowhere for cyclists to go, other than onto Glebe Road or Union Street, with heavy traffic, traffic lights, parked cars, buses, pedestrians, you name it… it’s a tangle that cannot be easily navigated. Consulting the Newcastle City Council Cycling Strategy to find out what is the vision for this area, I found the recommendation is to lower the speed limit to 40kph along Union Street. I think this has already been done, as has been done in many heavily trafficked suburbs approaching major arterial intersections. To make this lovely bike path more accessible and to generally enhance the atmosphere and safety of pedestrians and cyclists at The Junction, it would also make sense that car parking be removed from the few blocks along Union Street towards Hunter Street. 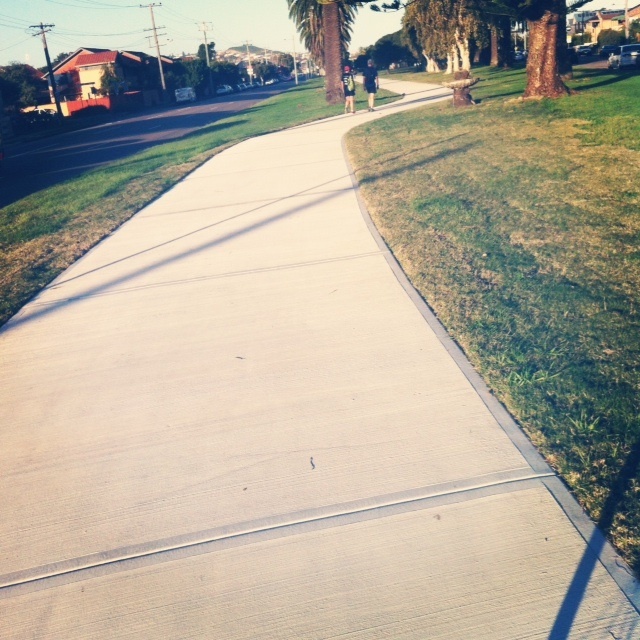 It would integrate this shared path beautifully into the general movement of people in the area. There is plenty of off-street parking in this area to accommodate parking requirements, and fewer car parks, along with the addition of a highly visible shared path in this very flat suburb, may encourage many to take up cycling to The Junction, rather than taking the car. This entry was posted in Uncategorized and tagged Bike tracks, car parking, infrastructure, newcastle, The Junction, Union St. Bookmark the permalink. This picture shows us a sort of cycle dream. By contrast it reminds me the bicycle tour I’ve taken yesterday: 47 km in the middle of heavy traffic on nasty roads. At the end, noise from traffic fought with my nerves. About security on bike path, I have a tiny bell on my handlebar. Though I should use it to prevent crash with walkers, I prefer talking with a neutral voice: a way to be as sympathetic as possible. I sometimes use my bell and sometimes say something or cough slightly as I approach pedestrians. I think it’s polite to say thank you if they move over too. Some of them find the bell to be rude but not many, I think. Your ride yesterday sounds very daunting! Hum, I will try another tour with more dedicated bike paths. Monday wasn’t the good window. As a member of city cycling association, I check some roads and paths with the aim to improve bicycle riding. I’ve been watching this path in the making and wondering how it could be of interest to me. I seems like a nice place to ride (down the middle of the park) but it’s not much without a decent journey attached to it. On ringing or calling out – I find there are different expectations on different shared paths – on some, the walkers prefer to enjoy the serenity and not hear rining bells – these people appreciate a small ‘passing’ or ‘on your right’ or ‘bike back’ – on other paths the walkers appear to get crumpy with a call and the only other alternative is the bell – so they get the bell. Its a challenge for the cyclist to know how to be respectful for your fellow path sharers. Tamara, I agree with both your points. The new path does not really connect as yet, hopefully it will soon, at both ends. With bell ringing, I have a bell that gives a single ding, I don’t get bad reactions from pedestrians when I use it and I think it’s better to warn others. When I am closely overtaken by a faster cyclist I would appreciate a warning too. Thanks for commenting, always like to hear from other novocastrians.